Update 2/14: Larry, along with 20 pounds of food and two bags of litter, arrived at Michelle’s house on Valentine’s day. He rubbed against her legs and checked out the entire apartment before he nestled in. Michelle is grateful for her lovely Valentine’s gift, and we are grateful to Michelle for giving Larry a new home! Can you help find a home for Larry? Larry absolutely loves human interaction, and he is in need of a new home where he can cuddle to his heart’s content. 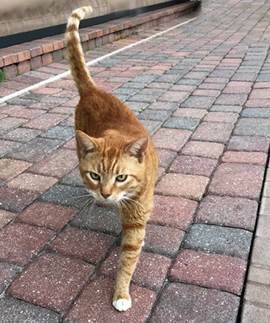 He’s a charming orange tabby who is about 8 years old. He gets along well with both dogs and cats, and has been well cared for by Dr. Gross at the Suburban Animal Hospital. Larry is neutered, declawed in the front, and microchipped. He is current with his rabies vaccine and will have an additional checkup on February 14th. As they are dealing with the challenges of serious illness, Larry’s owner and family would be deeply grateful to anyone who could adopt this affectionate kitty.